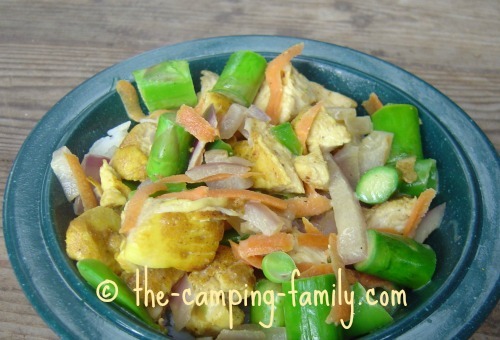 This Thai Coconut Chicken Recipe is one of my favorite easy one pot camping meals. It uses nutritious ingredients that are easy to pack. It can be cooked on a two-burner stove. Cut the chicken into 1 inch/2 cm cubes. Put 1 Tbsp/15 mL curry powder into the baggie. Add the chicken cubes. Shake until they are coated with curry powder. While the rice simmers, heat 1 Tbsp/15 ml of oil in the skillet. Add the chicken cubes to the skillet. Cook until the chicken is no longer pink (about 5 minutes or so). Chop the asparagus into 1 inch/2 cm pieces. 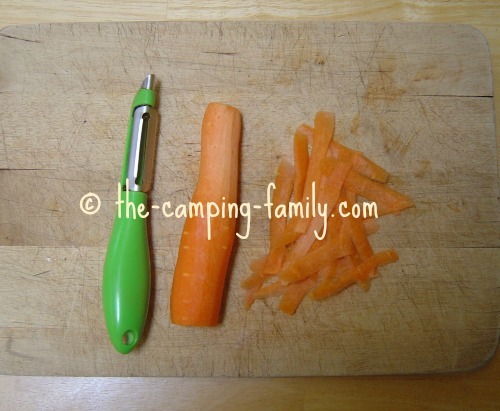 Use the vegetable peeler to turn the carrot into little strips. When the chicken is cooked, add the asparagus, the onion, the carrot and the snow peas to the skillet. Open the can of coconut milk. Pour it into the skillet. Cook until heated through. When the rice is ready, spoon it into individual bowls. Top with the chicken mixture. Next time there is a good sale on boneless chicken breasts, buy lots. Freeze them in packages of 2. When you pack for your camping trip, put a package of frozen chicken in your cooler with lots of ice. Plan to have this coconut chicken recipe on the second or third day of your trip, when the chicken has thawed but is still cold. I hope you enjoy this easy Thai Coconut Chicken recipe! 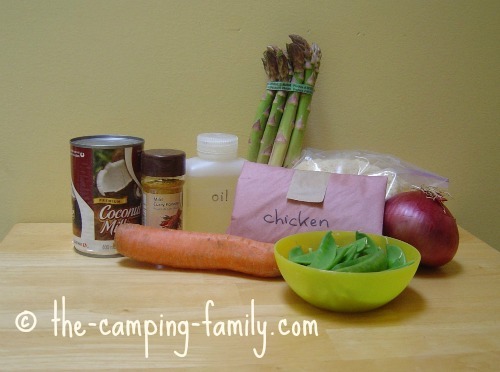 For more tasty camping food ideas, click here. Are you planning a camping trip? Please visit the The Camping Family home page. You'll find lots of helpful ideas.